PHR/SPHR Audio Study Guide: Practice Questions Edition! Best PHR Test Prep to Help You Prepare for the PHR Exam & Learn Test Secrets! You are no doubt a busy professional with a lot of things going on! It can be challenging to find the time to read and study for the PHR/SPHR test! However, the truth is that the PHR test is a challenging exam. It is normal to have some anxiety about taking this test. The test has 225 multiple-choice questions, and they have to be answered within four hours. The questions are randomly generated, and each test is unique. In order to pass the test, a score of 500 out of 700 is required. Thorough preparation cannot be overlooked! 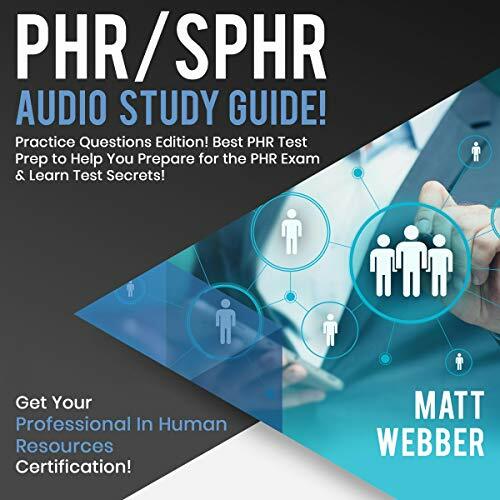 That is why the author Matt Webber, a human resources professional, developed the PHR/SPHR Audio Study Guide! This edition is a practice-questions edition that contains multiple-choice questions with detailed rationales. Each section is divided into subsections making sure all aspects of the exam are covered! If you listen to our study guide in addition to pursuing other study methods, we are confident you will pass the PHR/SPHR Exam! So go ahead and scroll up, and click "Buy Now" today! The book is easy to listen/easy to follow. I am cramming to pass the test to prepare for new job, and this book has been great for me. I love the practice test questions. Great tool for the PHR Exam! This audible book is amazing.you have to buy this book if you are taking the PHR exam. I just took and passed the PHR a week ago and I swear that lots of this material were on the test word for word. This study guide has lots of practice questions! It also has lots of useful definitions.This review has been great. This study guide has lots of practice questions! It also has lots of useful definitions. It is a smaller study guide with all the info you need packed in..This guide is very well written.This book is absolutely great if your looking to be in The HR field so buy it!! I highly recommend it to anyone wanting to get certifications to further their career. It is easy to follow. me to pass the PHR the first time around. My plan is to keep the book for reference as I continue my HR career..Passed the PHR on the first try using this study guide. don't waste your time using more expensive products if you already have a base generalist knowledge. Used the more recent version again for the SPHR and passed that as well on the first try using only this book.ly. The explanations/reasoning for the answers to the questions were extremely helpful. Excellent book for HR students. This book helped me feel confident about taking the exam. I used it to prepare for the PHR and passed the exam!! !This is a great preparation book for the exam.this was the only study materials i got for the PHR and I passed on my first try. I read it front to back, over and over, and took notes. easy to read and also gives real life examples of PHR best practices. I recommend this to anyone studying for the PHR/SPHR. The chapters explain the concepts in great details. This PHR/SPHR was extremely helpful. I found information on this book that was not in the classroom books that helped me pass my PHR.Beautiful book - great condition !This PHR/SPHR was extremely helpful. Great study guide.I used this book to study for my SPHR and it was great preparation!!! I passed :)Well thought out and put together in a way that makes it easy to move from one topic to another. the exam makes sure you can APPLY them. This book was a great guide, the practice questions were awesome, and the software option was a resource I used all the way up until the exam...I enjoy the tools given to help me with my studies.The first one is more an explanation of the exam, The book is really good and very detailed, like loooong detailed. It is a very complete guide, just allow yourself a full month or at least 3 full weeks to dedicate your time to study. it could have been so much more beneficial if it had more.it would've been nice to have questions to test your knowledge!study guide helped me to understand the concept of the PHR exam in a comprehensive view. Very informative. Like how the reviews not only give you the answers but also explain the answers.Would recommend, very straightforward.I think thus far this exam prep guide has been very informative with most recent up to date information needed for testing. It was a good system and kept the things fresh on my mind. This is a great resource for my studies. The book was precise and very easy to navigateI. think overall it's a good quick study guide but will need to get additional more in-depth information on topics. study guide helped me to understand the concept of the PHR exam in a comprehensive view.It has been an awesome tool as part of my studies for the PHR .Thank you so much!